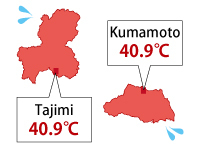 If it is called a hot place in Japan, it tends to seem that it is a prefecture in the way of south, such as Okinawa and the Kyushu district, but when the highest ever temperature is investigated, it is 40.9 ℃ observed in Kumagaya-shi, Saitama and Tajimi-shi, Gifu on August 16, 2007. As a cause, the influence of a heat island effect monsoon etc. is considered. 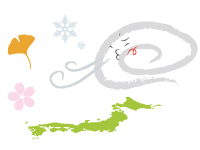 The lowest temperature of Japan is -41.0 ℃ observed at the meteorological observatory in Asahikawa in Hokkaido on January 25, 1902. 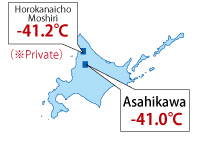 Although -41.2 ℃ lower 0.2 ℃ than this in Moshiri, Horokanai-cho in 1978 is recorded, since it had separated from the official score of the Meteorological Agency, -41.0 ℃ of and Asahikawa is observed with the lowest temperature. Since the typhoon had a number in the order which arose to the earth, it may not come as an order. 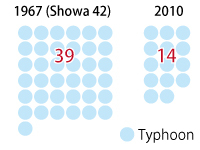 If observation record of the past typhoon is seen, it is made for there to have been much 39 in 1967 (Showa 42) for there to have been most. Conversely, at the very bottom is 14 in が 2010 among. 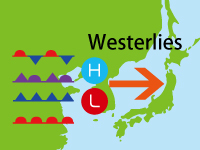 That the weather changes east from the west occurs in the limited areas, such as Japan, Europe, the United States. 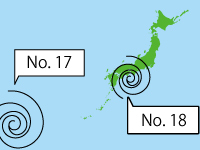 This is because a strong wind blows from the west to the east by the westerlies which are over near Japan. Since the front and atmospheric pressure which occurred under this influence in Korea etc. are east passed from the west in many cases, the weather is also put together to it and changes east from the west.In the area near the equator, such as the Philippines and Guam, since a strong wind called the trade winds blows to the east, the weather changes from the east to the west. 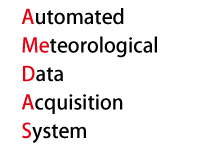 About AMEDAS is the abbreviation for (Automated Meteorological Data Acquisition System), and is the automatic weather survey system installed in about about 1300 pieces across the country. The information to which it comes from this installed system is collected, and the weather is forecast. 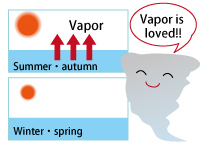 A typhoon develops based on the vapor which evaporates and comes out from the warmed sea water.Therefore, it generates from summer which sea water temperature goes up in autumn.Although a typhoon is sometimes seen also at the time of spring or winter, in order not to not much approach near Japan, there are some persons who think many from summer in autumn. Since autumn, winter, and humidity fall, the body burns energy in order to maintain body temperature.The amount of blood is restricted and nutrition will stop therefore, spreading in the surface of the skin, or the terminal part of hand and foot so that excessive energy may not be consumed. since the amount of secretion of the sebum which carries out the barrier of the skin becomes the minimum, the time evaporates [ moisture of the skin ] more often.As a result, it becomes easy to dry skin. If a weather report is heard, compared with a normal year, it will hear occasionally that it is quantity, that it is low, but the average for about 30 years is used with this normal year. It is not 30 years ago and has updated every ten years. 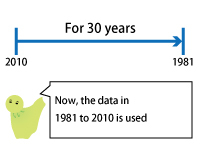 The data from 1981 to 2010 is used now. Westerlies are winds from the west always blown through every year. However, compared with summer, if autumn, winter, and spring come, a strong wind will blow and it will bring about various phenomena. For example, since westerlies turn into a fair wind or turn into a head wind in case of an airplane, time may differ both ways also in the same course for 1 hour or more.